A study analyzing the design-build project delivery method in the United States shows it was used on average in more than 50 percent of non-residential construction projects in 2018, a ten percent increase since 2011. A study analyzing the design-build project delivery method in the United States shows it was used on average in more half of non-residential construction projects in 2016. The study was commissioned by the Design-Build Institute of America (DBIA) and was completed by RSMeans Reed Construction Data Market Intelligence. 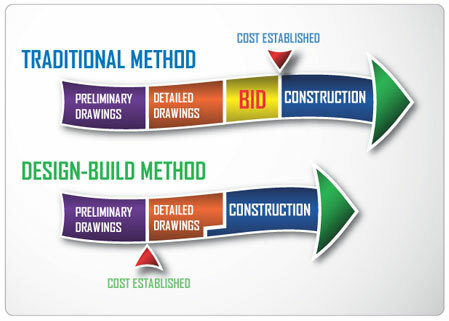 Design-build is an integrated approach that delivers design and construction services under one contract with a single point of responsibility. LEC’s design/build business model is based upon us taking ownership of your project. As both your engineer of record as well as your electrical contractor of choice, we view our responsibility to be your advocate in the construction process. Every LEC design/build project starts with a completely engineered and mutually agreed upon set of electrical drawings. This way, there are few surprises during your construction project, and you will be able to understand exactly what to expect from us. LEC is a State of Minnesota Licensed Design Firm and a Professional Engineering Firm. LEC specializes as your consultative electrical engineer to architects, owners and general contractors. Our expertise will help you to minimize your costs while properly designing and specifying exactly what you want out of your next project. LEC’s staff includes LEED accredited personnel fully versed in the latest green building standards and we specialize in sustainable electrical design. Our lighting designers, engineers and draftsmen are all full time employee…not people who work at other firms. Over 75% of LEC’s annual sales volume is Design/Build work. Lastly, LEC exists today because of the repeat business of our existing customers. We have been fortunate enough to keep our customers long term due to our entire organization’s commitment to complete satisfaction of our clients.